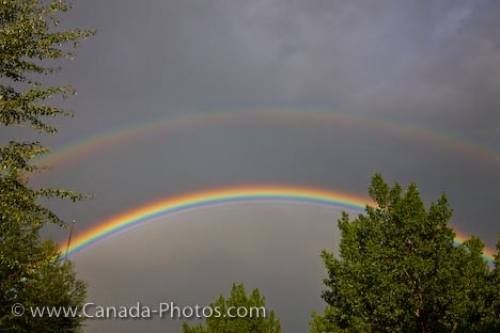 As a thunderstorm sweeps over the City of Regina in Saskatchewan, Canada, enough sunlight has broken through the dark clouds to create the beauty of a double rainbow above the trees. The seven vibrant rainbow hues are very prominent in the lower arc while the upper rainbow is fainter amongst the dark level of the cloud line. Across the prairie landscape of Regina, Saskatchewan, thunderstorms are often seen during the spring and summer, usually from the end of April until the end of September. Some of these include spectacular lightening shows, hail and many may bring with them the possibility of a tornado. Saskatchewan averages about fifteen tornadoes per year, but many thunderstorms pass through quickly and leave behind the beauty of a double rainbow. Picture of a double rainbow during a thunderstorm over the prairie landscape in the City of Regina in Saskatchewan, Canada. Rainbow forming during a thunder storm in the city of Regina, Saskatchewan, Canada.